I've been busy this week. My schedule at work is slowly getting back to normal and I'm not so exhausted when I get home at night so I've been able to sit at my sewing machine for a little bit before going to bed. First on my to do list this week was the Star Surround QAL weekly assignment... HSTs... Lots of them. Sorry about the really bad picture... It's late and the lighting in my sewing room isn't great at night. So you can't really tell from that awful picture, but those HSTs are almost perfect! :-). And can you see that pile over there? Yes, I had to trim ALL those HSTs! Next, I pieced my fifth Swoon block. I love that navy fabric! And finally, I've playing with some paper piecing again this week and I completed my first Circle of Flying Geese block. I plan on making 3 more blocks and turn them into a nice wall hanging. 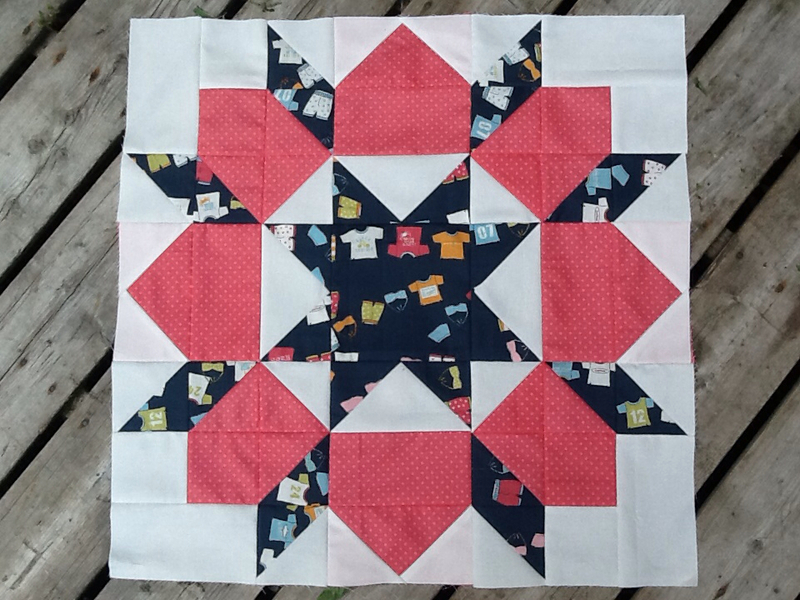 I loved making this block! So much fun. And that's what's been happening in my little corner of the world. How about you? What have you been up to lately? If you are looking for inspiration, why don't you click on that WIP Wednesday button on my sidebar and check out what everyone around blogland has been working on. 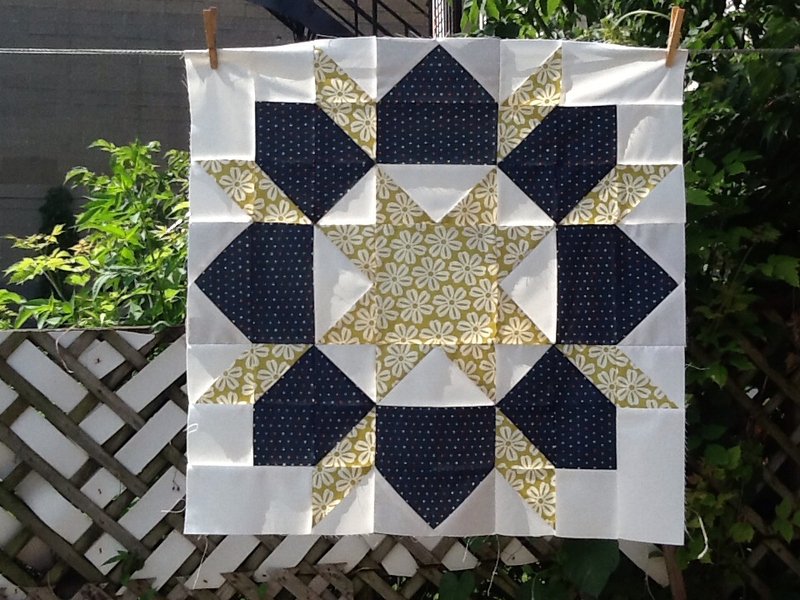 Are you participating in Melissa's fabulous Star Surround QAL? If not, it's not too late as we are only at the cutting stage. Get all the details here! Melissa's instructions are always super clear and easy and there are prizes! This week's assignment was to get all of our pieces cut and ready for sewing. I decided to go with the 2 x 2 same fabric layout with 24" blocks. This is what I feel I can keep up with given my crazy busy schedule at work these days. So here are all of my pieces. 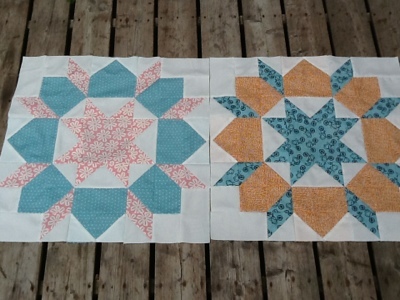 I'm going with Color Me Retro fat quarters for the stars, Kona black for the surround and Kona Snow for the background. I hope you are having a wonderful Sunday! Over here, we are having a beautiful sunny morning, but there is rain in the forecast... Looks like I'll be spending some time in the sewing room! Linking up at Melissa's for the Star Surround QAL. 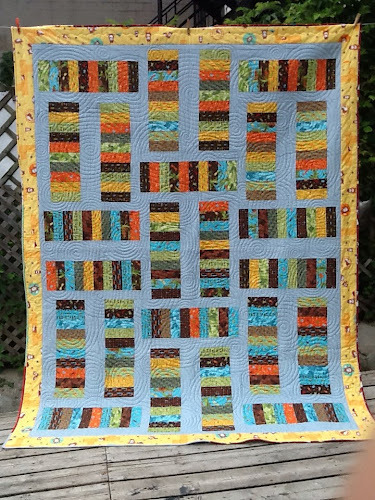 I finished Dylan's Quilt last night! The pattern I used is called Stacks of Colour and was designed by Pam and Nicky Lintott (the book is Jelly Roll Dreams). I used one Meadow Friends by Deb Strain jelly roll and some Moda Bella cloud for the background. 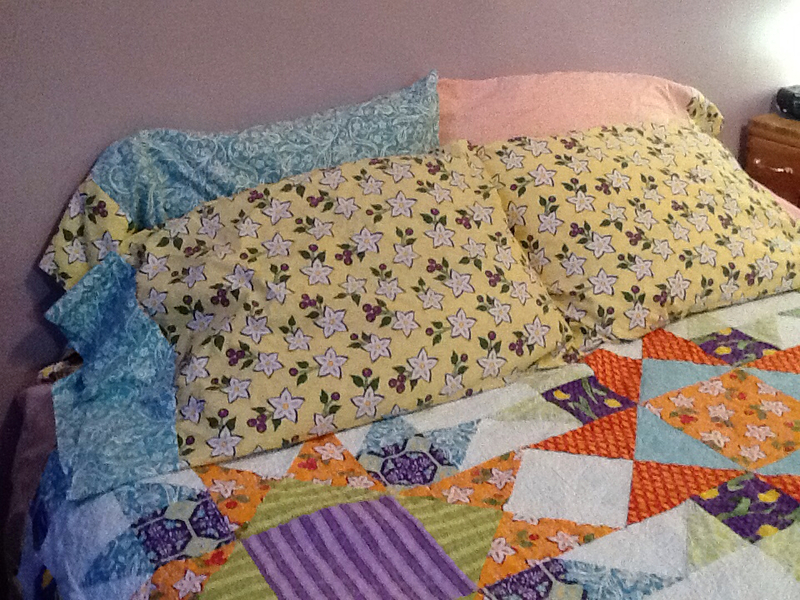 The finished size of the quilt is 68" x 88", perfect for a twin size bed. 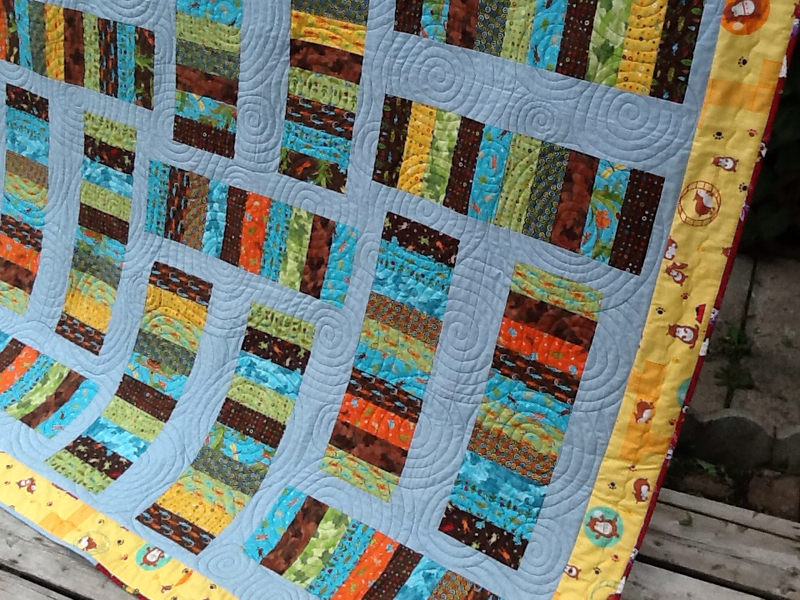 I quilting big spirals and some wavy lines in the border. The backing is a super cute farm print from Alexander Henry I think. Dylan slept under his new quilt last night and that makes me incredibly happy. It is such a great feeling when the people I love fall asleep wrapped in something I made specially for them. Linking up at Amanda Jean's for Finish It Up Friday and at TGIFF hosted at What a Hoot Quilts this week. 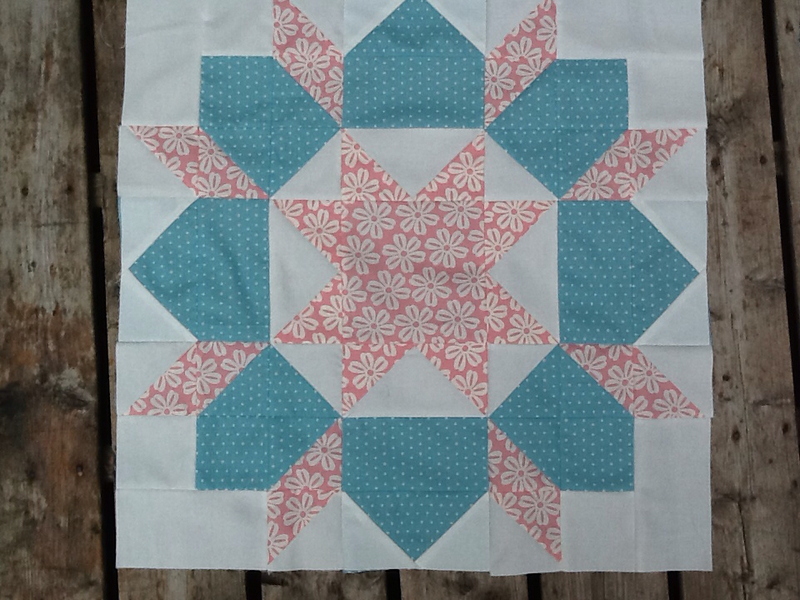 I stayed up a little later than usual last night and got my fourth Swoon block pieced. I really like this one... But then again, I've said this about every Swoon block I've made so far. :-) Block 5 is on the agenda for Friday night. I might even participate in my first ever Friday Night Sew-In this week. Yay! I feel like I'm suffering from quilting ADD or something. 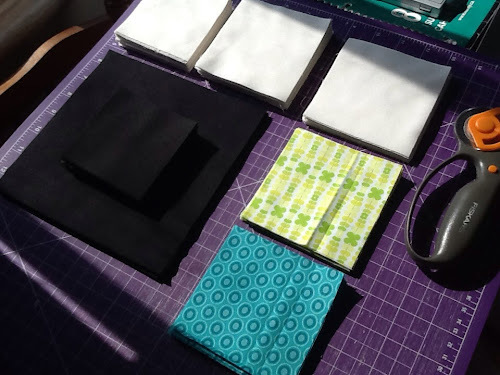 I have what feels like a million things on the go in my sewing room. 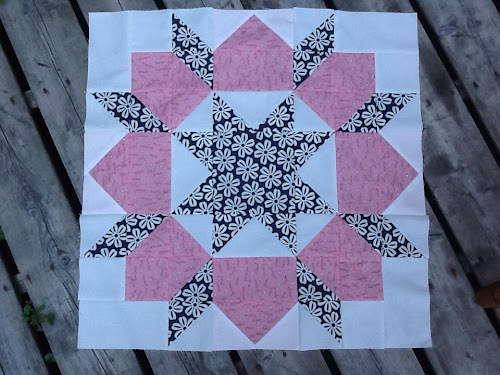 And since it is the middle of the week, I thought I would link up at Lee's for WIP Wednesday! 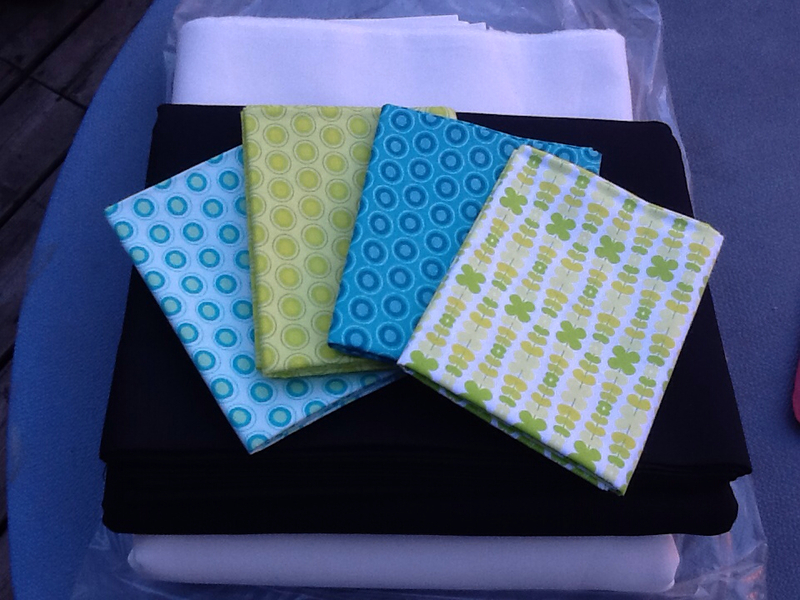 This is the pile of fabric I pulled for the Star Surround QAL going on at Happy Quilting. Some Kona Snow for the background, Kona Black for the surround and Color Me Retro fat quarters (Jeni Baker) for the stars. Our assignment this week is to cut the fabric. That has to happen at some point between now and Sunday night. Next is the #swoon2013 QAL. 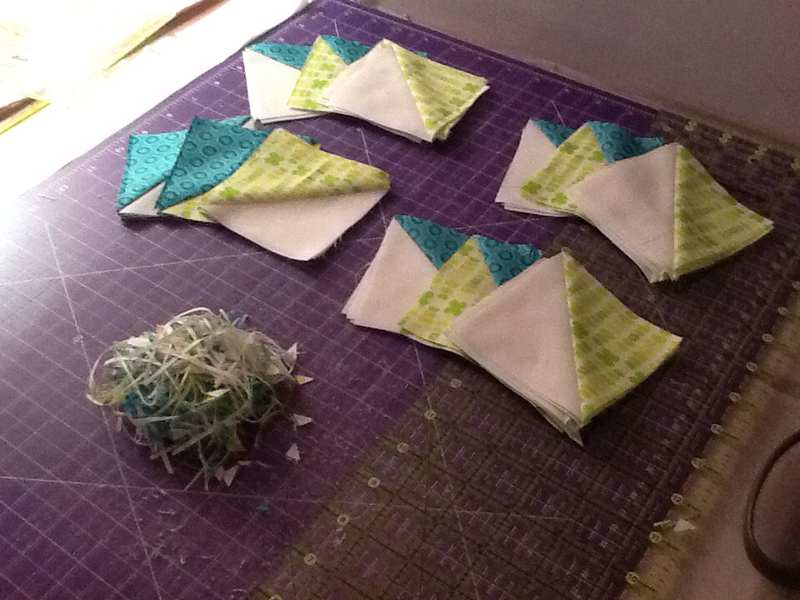 I have all my blocks cut and into small bags ready for sewing. So far, I only have 3 blocks done, but number 4 is getting pieced tonight I hope. 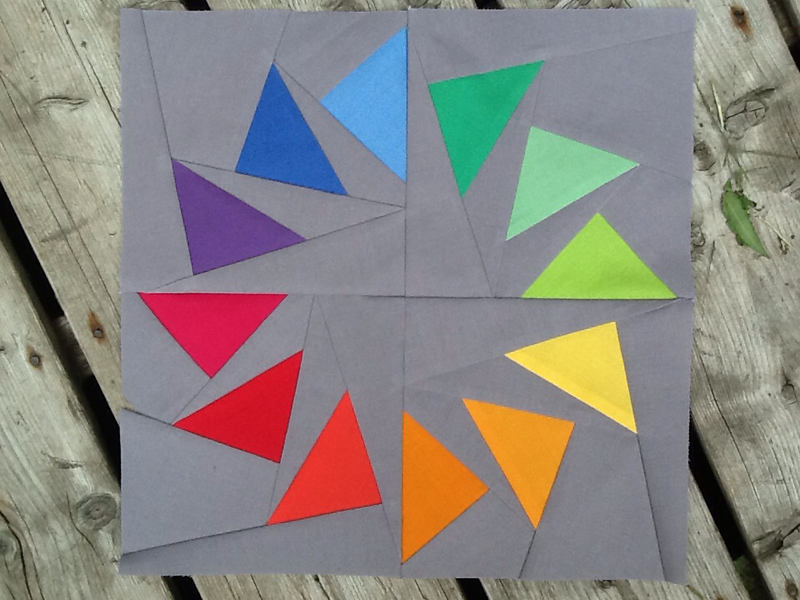 I also picked the pattern for the Montreal Modern Quilt Guild challenge which has to be ready for early September. I now just have to choose the fabric. More on that in a future post. 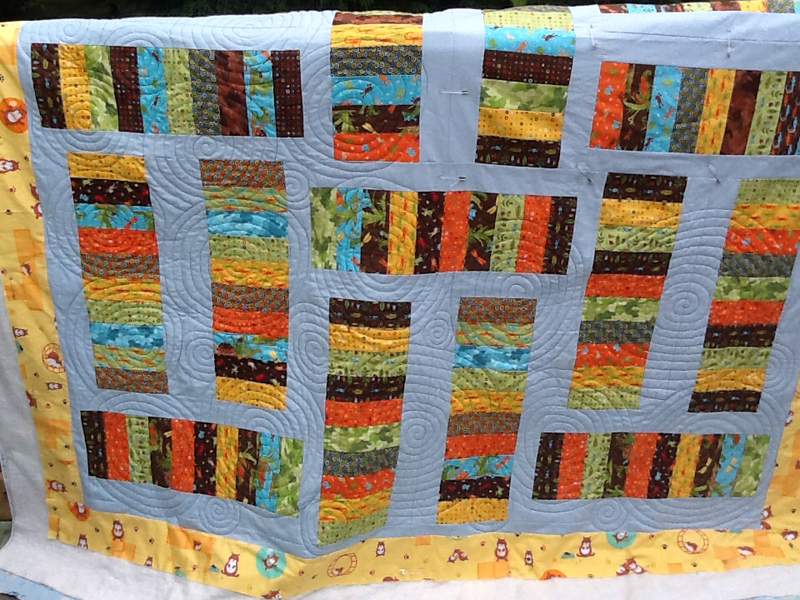 As for finished projects, I completed the quilting on Dylan's quilt and the binding is all ready. This will be a Ta Da post at the end of the week. And I made more pillowcases for my bed. For more information on the tutorial I used as well as the fabrics I chose, go here. My sweetie may have remarked that our bedroom is starting to look a little too girly for his taste. :-). But having that quilt and those pillowcases on my bed makes me so happy! Be sure to click on the WIP Wednesday button in my sidebar to check out everyone else's WIPs! 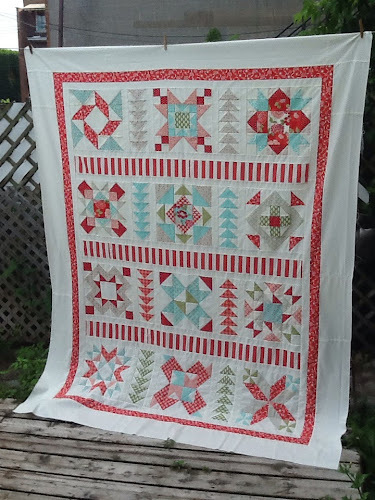 I finally got around to piecing block number 3 for my Swoon quilt last night. I also made some progress on the quilting for Dylan's quilt. You can check out the design I chose here. Tonight, I'm going to try to make at least one more pillowcase for my bed and then pick my fabric for a new QAL that just started at Happy Quilting. 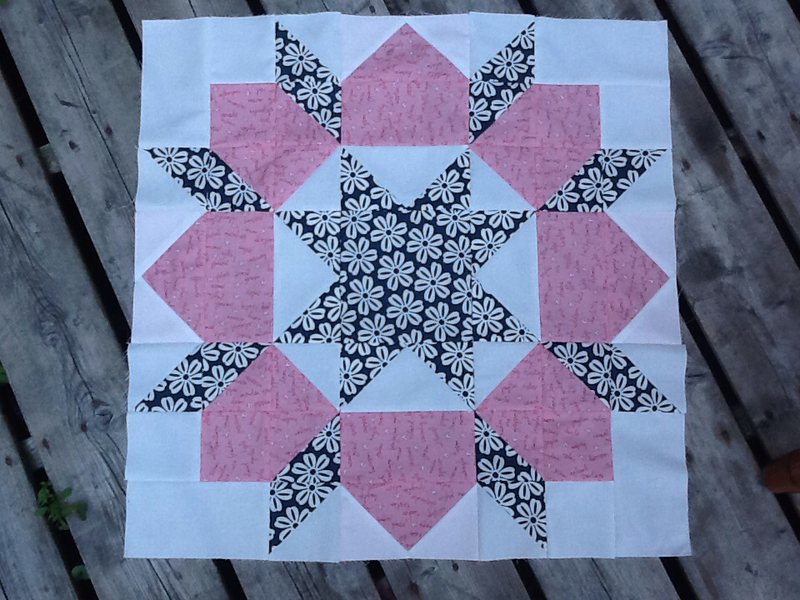 I loved making Starburst in January of this year which was Melissa's first QAL, so I decided to do this one as well. I know many quilters like to use practice squares to hone their FMQ skills, but me, I just like to practice while I'm actually working on a real quilt. The people I give my quilts to don't care that the quilting isn't perfect, they don't care that a couple of lines aren't straight or that a few stitches got skipped. 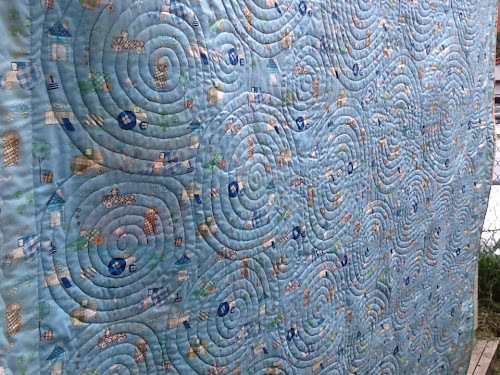 So on Dylan's quilt, I decided to try something I had never done before - spirals. BIG spirals! They are not perfect, in fact, a few of them are really bad. But if you look at the quilt while driving at 10 km/h, you won't notice how bad they really are! :-). And I really like the texture I'm getting with this design. 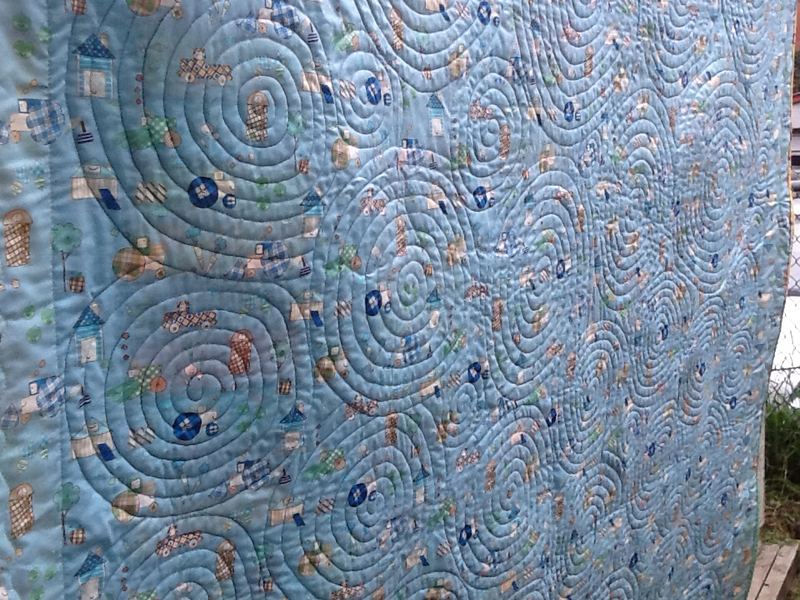 There's a bit of space between each line in the spirals so the quilt is nice and soft. I'm about half way done now so I should be able to finish the quilting and sew the binding on next weekend. Yay! I was a lot more successful finishing up my Fat Quarter Shop Designer Mystery top. 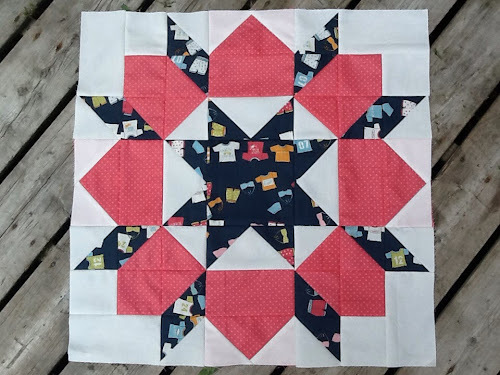 I got lazy in the end though and decided to stick to a plain 3rd border instead of making the pinwheels the pattern calls for. The binding is going to be red so I think it'll all come together very nicely. I don't think I'll be able to get this one quilted for a while (I just can't tackle another big project right now) so it'll go to the pile of tops for a few weeks. I used a tutorial from Twiddletails and it went together super easy and fast! My sweetie has now asked for his own pillowcase with a blue trim instead of pink. And I'm more than happy to oblige of course. 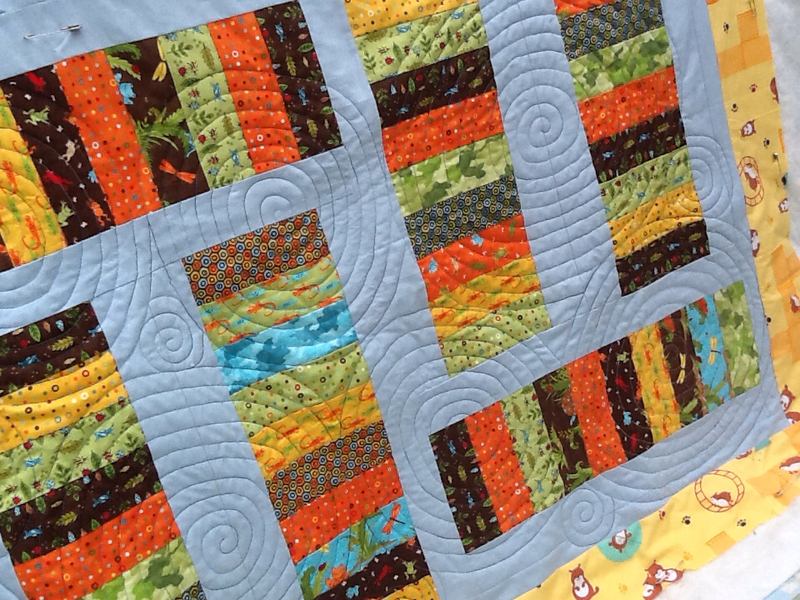 Linking up at Crazy Mom Quilts for Finish It Up Friday and TGIFF hosted by Quilt Matters. I had a full weekend of sewing planned, but my sewing machine in the country had other plans apparently. I started quilting Dylan's quilt and after just a few minutes, I noticed that the hand wheel was suddenly really hard to turn and then the thread kept breaking. I cleaned the bobbin case, re-threaded the whole thing, changed my needle and played with the tension, but nothing seemed to work. 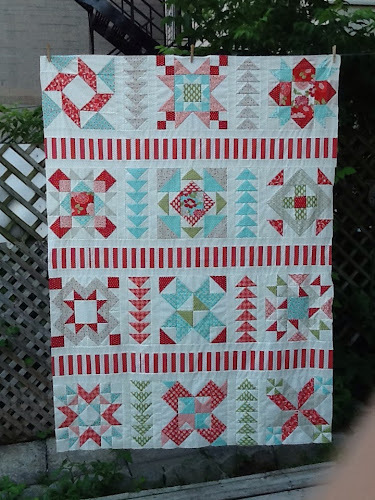 Before I left to go to the cottage on Friday, I managed to make a lot of progress on my FQS Designer Mystery BOM top and should have a finished quilt top in a couple of days. I also finished block 2 of my Swoon quilt. I think I'm a little bit behind on this QAL because I should have block 3 done by now, but I'm hoping to catch up this week. I didn't realise how long these blocks take to piece. I must have spent almost 3 hours today sewing my 2nd block! I hope you have a great week. As for me, I'm off to catch up on my blog reading. I am sooooo happy to reveal my latest finish because this one has been a WIP for quite a while. 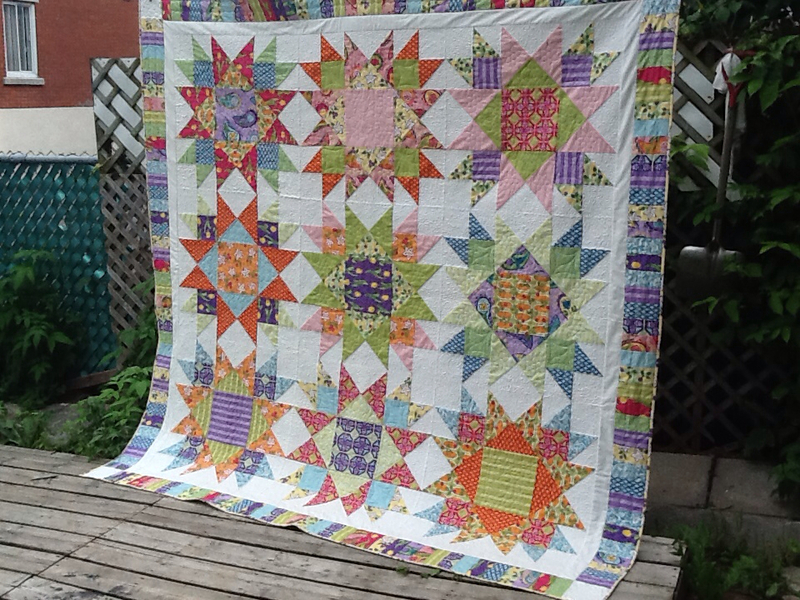 I finished piecing the top in December 2011 and have basically been quilting it ever since. Last night, I finally put the binding on it and it is right now tumbling gently in the dryer! Yay! 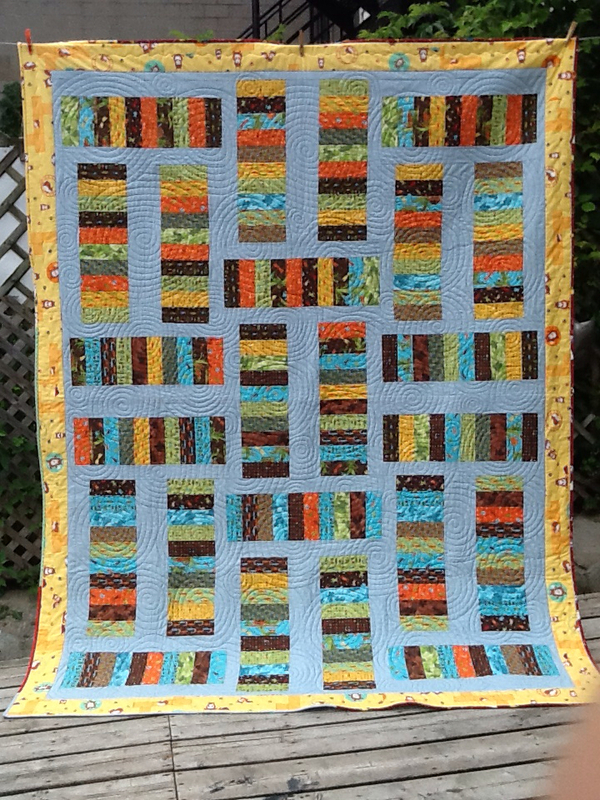 This quilt is BIG (approx. 82 x 82) so I had a hard time taking a decent picture of it. It didn't help that it looked as though a huge thunderstorm was about to begin so I had to rush. The fabric is Veranda by Amanda Murphy and the pattern is a big Schnibble designed by Carrie Nelson (from the book Another Bite of Schnibbles). I quilted a bunch of different designs in the blocks, some stippling in the white areas and some wabbly lines in the border. 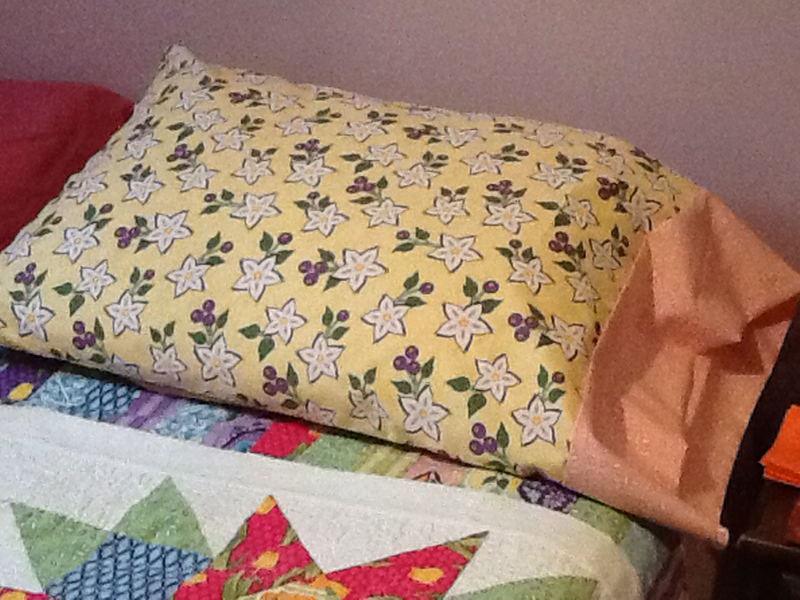 I finished it with a yellow binding from the Veranda collection. 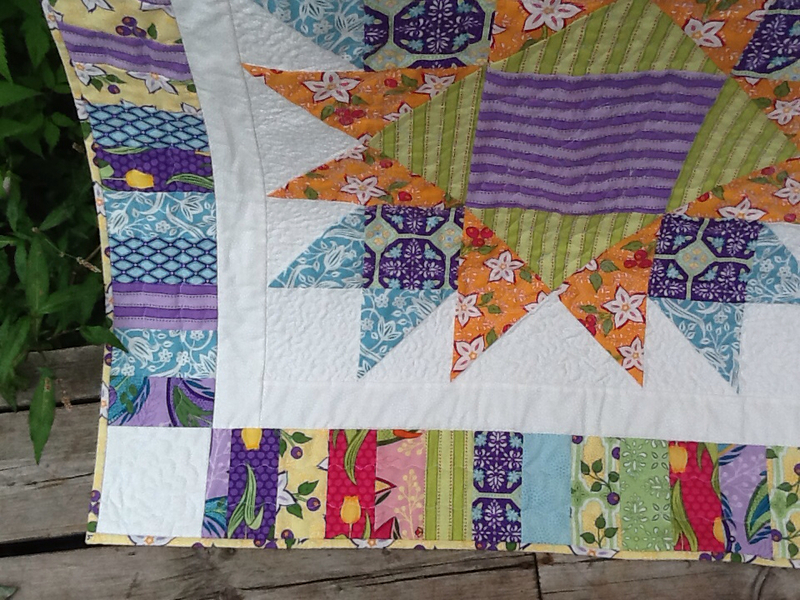 Linking up at Crazy Mom's for Finish It Up Friday and at Quokka Quilts for TGIFF! Have a fabulous weekend everyone and Happy 4th of July to all my American friends! Happy Wednesday everyone! I've got a few things in the works this WIP Wednesday, but the project that's been keeping really busy this week is the 2012 Fat Quarter Shop Designer Mystery BOM. I pieced the last block at the beginning of June and I'm now piecing the top together. If you signed up for a FQS BOM in the past, you know that the finishing design is always a little bit involved... To say the least. This year is no different. Lots and lots of flying geese (thank goodness for my Fit To Be Geese ruler!). I've got the middle part all done. I just need to get going on the 3 - yes 3 - borders and I'll be all finished! Yay! 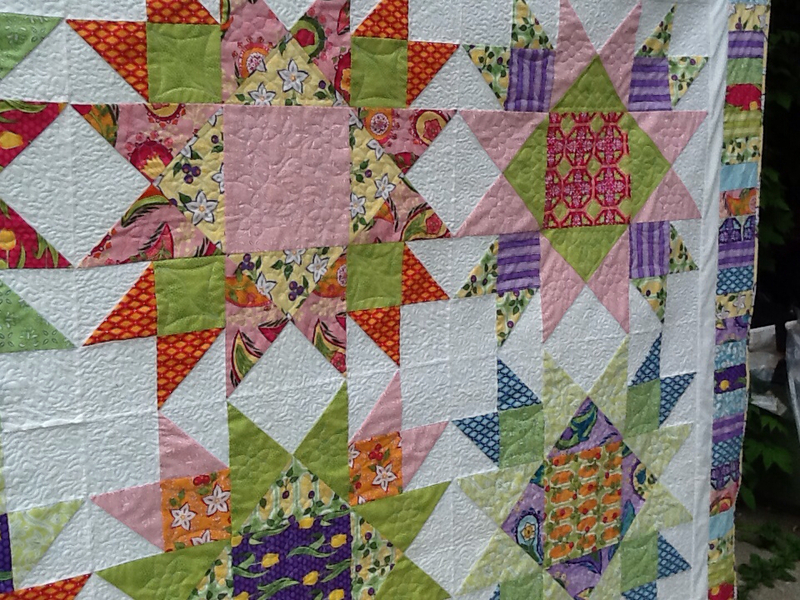 I loved making these blocks and the fabric from the Vintage Modern collection by Bonnie and Camille is just so yummy. 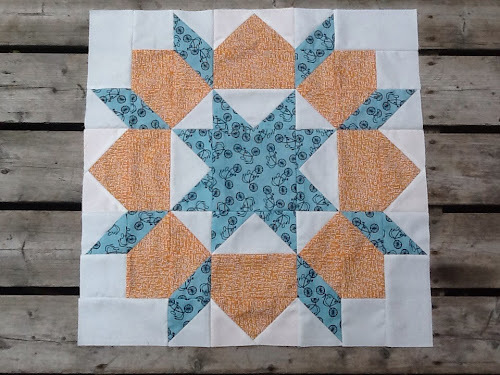 Linking up at Lee's for WIP Wednesday (click the button in my sidebar to check out all the WIPs).